The Meaning of Human Nutrition presents information basic to human nutrition. An effort is made to relate food and human nutrition to the history of man's struggle for survival and to efforts to control the environment to his advantage. Several lists of events are included to relate these efforts chronologically in history to show how great discoveries or ideas have evolved gradually. This book has 10 chapters; the first of which provides an overview of the study of human nutrition. Basic concepts about human nutrition are then introduced, including the early man's concepts about food and survival on earth as well as the relationship between man's dietary problems and technological changes. The role of government in a democratic society to sponsor education and well-being of all citizens is also considered. The chapters that follow focus on growth and development as indicators of nutritional status, food guides to nutrition, nutrient content of food, and recommended dietary allowances. The book discusses as well the body's need for nutrients and its use of energy, protein as a source of amino acids, and the importance of vitamins and minerals in human nutrition. The final chapter analyzes consumer concerns about food and nutrition. 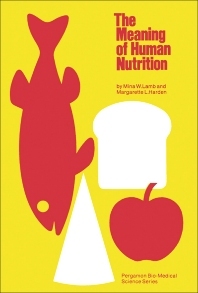 This monograph is designed as a textbook to help students develop deeper knowledge and understanding of human nutrition.